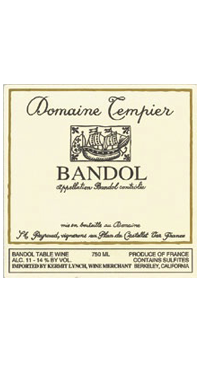 The Cuvee Classique Bandol is a blend of Mourvedre (70-75%) with lesser amounts of Grenache, Cinsault and Carignan. The grapes are harvested from various vineyards on the Domaine, mainly clay and limestone soil. No chemicals are used in the vineyard and the grapes are hand harvested in small 30kg baskets before, hand sorting and fermenting in stainless steel or concrete vats. The wine is then put in large oak casks (25-75 hl) to complete malolactic fermentation and aged for 18-20 months before bottling. This is a red that has incredible ageing potential. Aromas of dark fruit and spice abound and the palate boasts ample fruit and dusty tannins. With 5 or more years in the bottle the wine will develop layers of complex aromas and flavours of leather, earth and red fruits.